The Magpie Heritage Celebration Night was held at West’s Ashfield as a fundraiser for the West’s Ron Massey Cup team. With over 300 people attending. The Pratten Park Magpies had a table and by chance it was table number 1. Only a small section of the room before the troops arrived. Chairman Mick Liubinskas starts off the night in Grand fashion. Rick Wayde Emcee doing his best Bruce Sacre impersonation. John Elford and his daughter Brienna. A very happy Tommy Raudonikis. A collection of Wests posters that were on display. The night is in full swing. L to R Ray Brown, Les Boyd, Tommy at rear and Roy Masters back to us. One of the ways to raise money was a Heads or Tails quiz. Rick Wayde asks Wests football question. Last man standing Alan Davidson. note: thats Neil Davidson sitting to the right of Davo. Ian Freeman and Bruce Clark. Rick interviews Wests Legends about the Fibros v Silvertails era. L-R Ray Brown Les Boyd, Tommy and Roy Masters. The back of John Dorahy. Big Steve and Joe Cool. Roy Masters and Les Boyd. Les back in days when we all had hair. Ray Brown and ex St George great Ricky Walford. Two Wests coaches from different times. Mick Potter and Roy Masters. Its Auction time Bruce Clark with a little help from Rick Wayde in action. Wests Lidcombe era ' Victa' Jersey up for Auction. Four authentic Lidcombe Oval Lockers. They went for just under 2 grand. No not the new owner. He can only wish. Wests Legend Trevor Cogger and Flying winger Mick Pinkerton. Thats Noel Kelly photo Bombing Carl Ross. Gentlemen Geoff Squires and Stephen Knight. 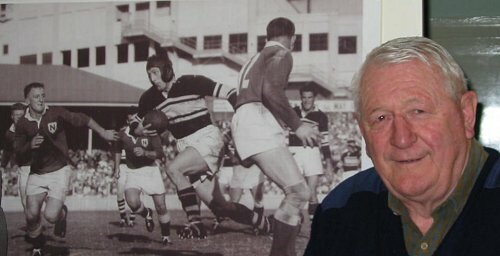 Steve played with Wests between 1972 and 1975. 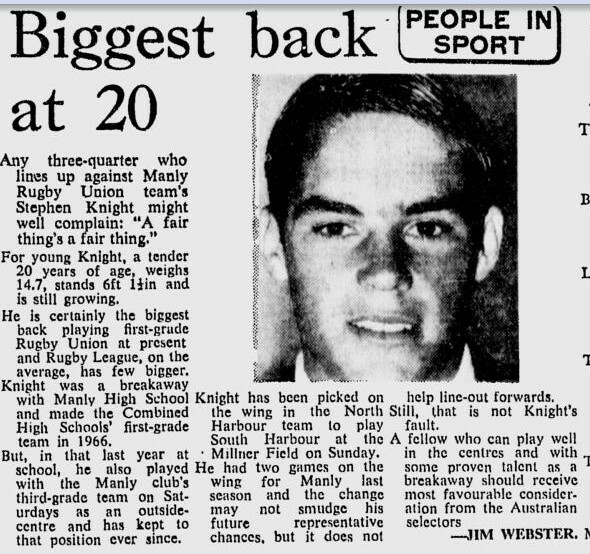 During his time at Wests Steve played 74 First grade games and scored 24 tries. 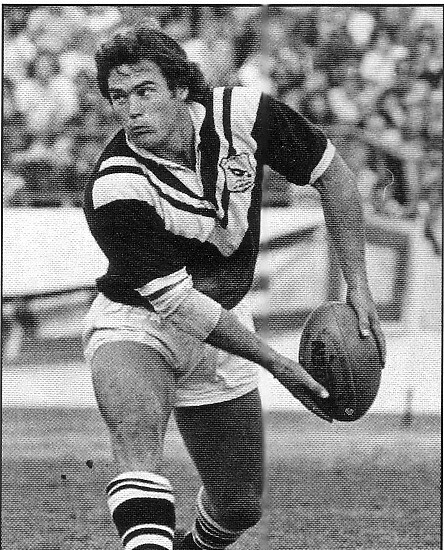 Steve came from Manly Rugby Union and had played 6 Tests with the Wallabies before he joined the Magpies. I have been to a lot of Rugby League nights/days over the years and this was one of the best run events by far. The food and service were first rate nothing was a problem. No wonder this club is going from strength strength. The Legends were happy to sign anything and have their photos taken over and over again always with a smile. Bill Owens video presentation was as always Brilliant. To me the whole night proved that the Wests spirit is still alive and strong. Well done to Rick Wayde and his team. "It is not the critic that counts, not the man who points out how the strong man stumbles, or where the doer of deeds could have done them better. The credit belongs to the man in the arena, whose face is marred by dust and sweat and blood, who strives valiantly... who knows the great enthusiasms, the great devotions, who spends himself in a worthy cause, who at the best knows in the end the triumph of high achievement, and who at the worst, if he fails, at least fails while daring greatly, so that his place shall never be with those cold and timid souls who have never known neither victory nor defeat."